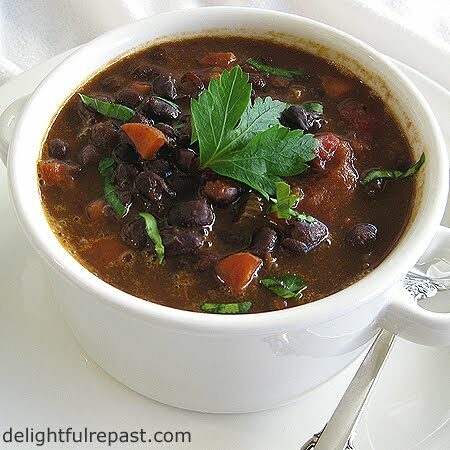 Black bean soup, made from dried beans, is my favorite black bean soup. It cooks down to a lovely smooth texture. Unfortunately, what I call a lovely smooth texture my husband calls something I won't even print here. He actually will not even taste that soup. Honestly, his "texture issues" can be so frustrating! But I didn't want him to miss out on the wonderful flavor, so I decided to see if using canned beans (drained very well, of course) would solve the texture issue. I'm happy to report, it did! He LOVES this soup! So tell me about your texture issues and other food quirks. And if you enjoyed this post (or the entire blog), be sure to tell everyone you know about it! 1 In large soup pot (I like the Le Creuset Round French Oven), heat oil and saute chopped vegetables until soft. Add salt, pepper, oregano, cumin and red pepper flakes; cook a few minutes to "toast." Add Worcestershire sauce and tomatoes. Cook, breaking up tomatoes with spoon, until tomatoes have "cooked down" a bit, just a few minutes. Add beans and broth. 2 Bring to a boil; reduce heat and simmer, stirring occasionally, with lid slightly ajar for 2 hours or until it's the consistency you like. Taste and adjust seasoning. Just before serving, stir in the juice of 1 lime. Garnishes to choose from: sour cream, cilantro, round slices of lime, lime zest, finely diced red bell pepper, diced avocado, shredded cheese. Chris has a problem with textures too...so I understand your frustration!! This soup sounds wonderful! Thanks, Jenn. What are we going to do with these people! Love those black beans!!! Your recipe sounds great...well have to give it a go. No texture issues here....if it has the flavor I'm ready to eat! Super, GTN! Let me know how you like it. And, since you don't have those silly texture issues, you can cook this down to puree texture (or puree it) OR try it as is with the whole beans. I have never had a black bean soup like yours! The combination of flavours sounds really wonderful. Thanks, Angie! Hope you'll enjoy it soon. It IS getting to be Soup Weather! Thank you for sharing the recipe I adore bean soups - in fact I just love all kinds of soups! Denise, thank you. You should try my split pea soup. In fact, think I'll make that one tomorrow. Grant, that's wonderful. I hope you both enjoy my soup. I think the only other one I've posted so far is split-pea, but I'll be adding others. I like the idea of a weekly S&S Day! Thank you, Sully, for that supportive thought! I was not kidding when I said he refused to even taste the other kind! I'm so glad it's cooling off. I love soups like this, and I'm not picky about the texture. Can't wait to try this. Yum - this combination of flavours looks wonderful. And, fortunately, I don't have a fussy feeder to worry about - unless, of course, I count the teenagers! Gina and Amanda, thank you! I hope you'll enjoy the soup. I have never made black bean soup with Worcestershire - I'm going to try this. Q: is the texture difference that you leave the beans whole (so it's like broth with beans? ), rather than getting that thick bean soup consistency? And if I wanted to use dried beans that had been soaked, would I need to increase the cooking time? Thanks for sharing this! Hi, Ami! I think the Worcestershire adds a little "umami" meaty/savoriness. When made as directed, the soup gets fairly thick (rather than just brothy) while still keeping the beans whole. You could cook it further to lose the whole beans or simply puree it. When I make it with dried beans that have been soaked overnight, I cook just the beans for 2 hours, add the rest of the ingredients and simmer for 3 more hours. Again, one COULD puree at some point; but I prefer to let the cooking break down the beans. More time, more flavor! The soup looks so comforting. I wish I had it now when it's POURING rain! Thanks, Anne! Rainy days are my favorite days, and soup is my favorite rainy day meal. Patti, thanks for stopping by! Your quirk is a new one on me! I'll have to try it. I love the lime in the soup! Nice touch. Thank God, I have four kids who will eat bean soup. Black bean is our favorite. For some reason, it is more palatable than the other beans. Thanks for visiting my blog, Freaky Frugalite! Have a great week. Rebecca, thank you! I bet your kids would like my navy bean soup as well. Must post that one soon. 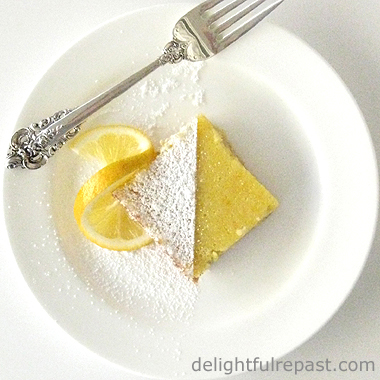 I've made this recipe a dozen times over the past year and its great! But I'm going to make Navy Bean soup tomorrow night. Any suggestions? Richard, thanks! I always make my Bean Soup with dried beans - a pound of Great Northern white beans. It sounds quite a bit like the Black Bean Soup recipe, but it has half as much canned tomatoes and no crushed red pepper flakes, oh and I put in about 4 ounces of ham. Hope that helps. I'll post the recipe eventually.